Between the United States’ debt ceiling crisis and some Republican’s unwillingness to compromise, and a similar feeling on the part of a number of so-called “school reformers” (and a little of that from a few people I consider to be allies in the fight against their actions), I thought it might be useful to put together kind of “The Best…” list. 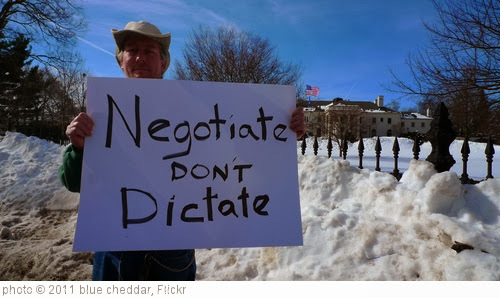 Coming from a nineteen year community organizing career, the whole point of public life is to get to the negotiating table and strike a deal, so I’m always perplexed by ideologues who don’t seem to “get it.” It also seems to me to be an essential skill to master in order to become an effective teacher, as well (and not a bad way of operating to model for our students, either). You might also be interested in The Best Posts Discussing Arrogance & School Reform. Obama Cites Lincoln As Model Of Principled Politician Who Compromised is from NPR. Ben Franklin on compromise is from TIME Magazine. What The Word ‘Compromise’ Really Means is from NPR. NPR has a nice story on the head of the Humane Society and the head of the Egg Producers group reaching a compromise on national legislation. It would have been nice if the two sides also had to have broader interaction between their constituencies to reach the deal. That might have happened, but the story doesn’t say anything about it. Nevertheless, I’m adding it here. The Washington Post has republished Daniel Willingham’s post on civility in the education reform debate and my response to it that was posted in my blog, It’s Not About Who’s “Evil” — It’s About Who’s Willing To Make A Deal. Getting Iran to say ‘uncle’ might not be smart is a useful article from Foreign Policy. Give and Take:Empirical Strategies for Compromise is from The Association For Psychological Science. Is ed reform headed for its own Bay of Pigs? is by Kathleen Porter-Magee. Fiscal cliff negotiations show how not to make a deal is from CNN. When Should You Compromise? is from The New York Times Learning Network. Psychology of Compromise: Why Congress Fails is from Live Science. The Neuroscience Guide to Negotiations With Iran is from The Atlantic. President Obama Provides Great Analysis Of Key Community Organizing Adage: Do You Want To Be Right, Or Effective? If you found post useful, you might want to look at the 700 other “The Best…” lists and consider subscribing to blog for free.